Neptune is the eighth planet from the Sun in our solar system. It is a gas giant (also known as a Jovian planet, after the planet Jupiter). Neptune is the first planet predicted through indirect observation and mathematical deduction, although Galileo did record it as a fixed star in 1612 and 1613. Aberrations in the orbit of Uranus led French mathematician and astronomer Urbain Joseph Le Verrier to propose influence by an unknown planet whose mass and position would effect it. His proposals were ignored until Johann Gottfried Galle at the Berlin Observatory found Neptune the first night he began searching for it in 1846. Neptune is approximately 4.5 billion kilometers  from the Sun which it orbits once every 165 years. It is invisible to the unaided eye because of its distance. Every 248 years, for a period of 20 years, the orbit of Pluto lies within the orbit of Neptune. Has mass sufficient for gravity to clear a path in its orbit. Neptune is approximately 30 times as far from the Sun as Earth (30 AU). Though slightly smaller than Uranus, it is more dense and is about seventeen times more massive than Earth (17 Earth masses). At its distance from the Sun, it receives about one thousandth of the same sunlight as Earth. 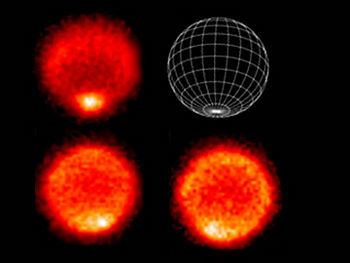 It radiates more internal heat than it receives from the Sun, though less than Jupiter or Saturn, indicating a radioactive inner core. ESO Very Large Telescope thermal images of Neptune's south polar region showing variation in temperature. The average temperature on Neptune is -200° C (-392° F). Recent measurements have shown the southern pole to be about 10° C hotter than the planet's average. This results in the vaporisation of the frozen methane and its circulation to the upper layers of the atmosphere. Neptune is comprised predominantly of hydrogen and helium. 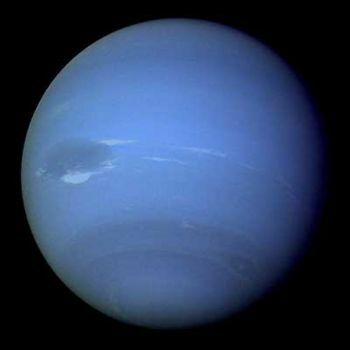 However, its methane component reaches the upper atmosphere absorbing red light from sunlight and reflects the blue spectrum making Neptune appear blue. Neptune has an orbital period (sidereal year) of 164.79 earth years. At is closest approach to the Sun (perihelion) it is nearly 30 times the distance of the Earth from the Sun (29.80 AU). At its furthest distance from the Sun (aphelion) it is 30.32 AU from the Sun. Neptune has thirteen moons. The largest, Triton, is geologically active, with geysers of liquid nitrogen. "Triton Color photo of Neptune's moon Triton on August 24 1989, at a range of 330,000 miles by Voyager 2 spacecraft using green, violet and ultraviolet filters.The regions that are highly reflective in the ultraviolet appear blue in color. 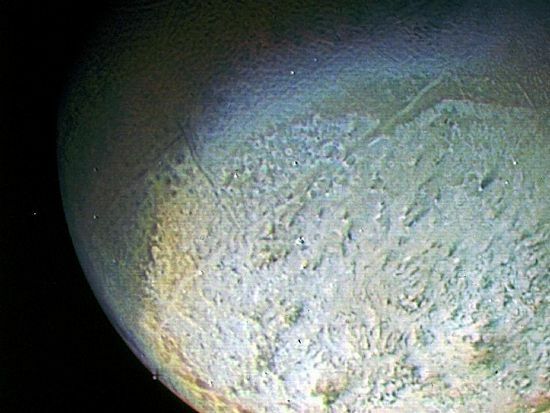 In reality, there is no part of Triton that would appear blue to the eye. The bright southern hemisphere of Triton, which fills most of this frame, is generally pink in tone, as is the even brighter equatorial band. The darker regions north of the equator also tend to be pink or reddish in color." Triton is the only large satellite with a retrograde orbit. Neptune possesses a number of Trojan asteroids. ↑ Podolak, M.; Reynolds, R. T.; Young, R. (1990). Post Voyager comparisons of the interiors of Uranus and Neptune. NASA, Ames Research Center. Retrieved on 2006-01-16. ↑ Duxbury, N.S., Brown, R.H. (1995). The Plausibility of Boiling Geysers on Triton. Beacon eSpace. Retrieved on 2006-01-16. This page was last modified 11:16, 26 October 2013.